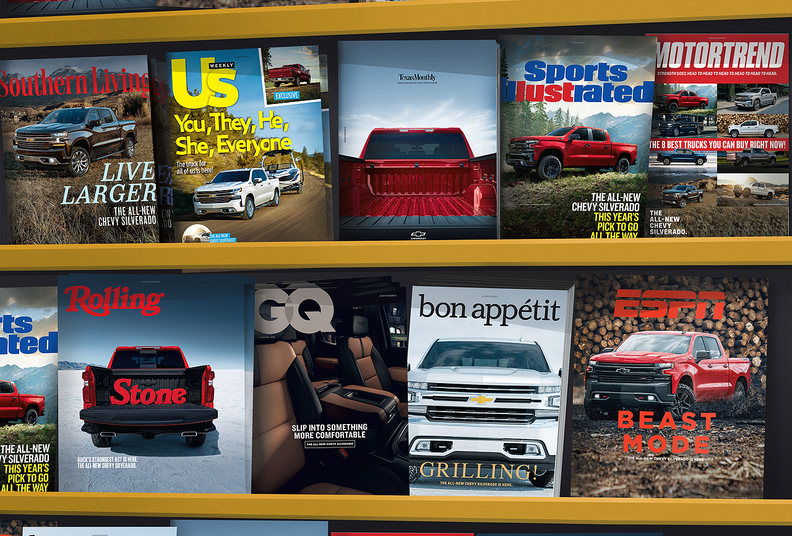 Chevy said it partnered with several magazines to sponsor several custom front cover designs. Magazine covers include Bon Appétit, ESPN, GQ, Motor Trend, Rolling Stone, Southern Living, Sports Illustrated, Texas Monthly and US Weekly. DETROIT -- Chevrolet will kick off a new advertising campaign for the redesigned 2019 Silverado on Monday night during the College Football Playoff National Championship. A 60-second ad called "A Little Bit Country, A Little Bit Rock n' Roll" features people utilizing the pickup while saying lyrics of the famed song from Donny and Marie Osmond. The ad is part of a new advertising campaign that aims to disrupt traditional print advertising, while evolving the brand's roughly 4-year-old "Real People. Not Actors" advertising campaign. It also includes a new deal for the pickup to be featured on Amazon packaging and several covers of lifestyle magazines such as Rolling Stone, ESPN and GQ, among others. Paul Edwards, vice president of Chevrolet marketing, declined to comment on whether the brand plans to advertise during the Super Bowl in February. The campaign is crucial for Chevy and General Motors. Silverado's U.S. sales were flat last year at more than 585,000 units, while sibling Sierra sales increased 0.7 percent to roughly 219,600 units. They compared to the segment-leading F-Series that increased 1.4 percent last year to nearly 910,000 units. Ram was up 7.2 percent to nearly 537,000 units in 2018. The new launch spot features everyone from cowgirls and cowboys on farms to kids with dirt bikes and city dwellers. The ad ends with actor John Cusack, brand spokesman, saying, "The all-new Chevy Silverado. It's a little bit country and it's a little bit Rock n' Roll." Chevrolet has touted the diverse range of styling and eight trim offerings as "a truck for every customer," which officials say is represented in the commercials. The campaign, Edwards said, is a "fresh approach" to and "evolution" of its highly touted "Real People. Not Actors" campaign. More traditional ads, which have featured focus groups, will air later. "The consistent architecture of 'Real People. Not Actors' will continue," Edwards said. Two additional spots focused on the performance of the pickup, including a class-exclusive remote tailgate, will follow the launch ad in the coming weeks and months. The ads, which were posted Monday to YouTube, are called "Official Truck of Real People," which has a similar tone to the launch ad, and "Tailgates." Chevy also will air a new U.S. campaign for the Silverado in Spanish that's targeted at Hispanic buyers, which Edwards said represent 20 percent on the market. Chevy, according to Edwards, is spending a "significant" amount on the new campaign. He declined to provide an exact amount. Chevy's advertising blitz, which was done with the brand’s agency-of-record Commonwealth/McCann, comes days after the national advertising launch of the 2019 GMC Sierra called "Step Up Like A Pro," which featured the pickup's exclusive six-function MultiPro tailgate. The GMC campaign launched over the weekend across numerous media and social media channels.